The Chief KITPS012018W Projector Mount Kit consists of the RPAUW Universal Projector Mount (2nd Generation Interface Technology), CMS012018W 12 to 18" Adjustable Extension Column, and CMS440 Speed-Connect Tile Suspended Ceiling Kit. The RPAU Universal Projector Mount is coupled with the SLBU Universal Interface Bracket. The 2nd Generation Interface Technology offers an enhanced security and unlimited projector access. The CMS012018W 12 to 18" Adjustable Extension Column saves the installation time and maximizes security. The CMS440 Speed-Connect Tile Suspended Ceiling Kit provides a host of features that allow you to securely install lightweight front projectors. This kit comes with four 25' flexible cables, 4 wood eyebolts, 4 concrete anchors, and a chrome trim ring. An inverted ceiling mount with the exclusive All-Points security system, the Chief RPAUW is the top-selling projector mount in the industry. Ideal for use offices, schools and homes, it is supplied with everything needed for quick installation, a low-profile look and easy projector maintenance. It features a solid steel design, integrated cable management, and independent roll, pitch and yaw. It offers easy projector maintenance, quick projector connect/disconnect, and adjustable mounting legs and feet. The patented All-Points is an integrated security system that uses security hardware at all key connection points to protect projectors from theft. Steel-into-steel construction makes All-Points more effective than other integrated security systems. Independent Roll (+/-4°), Pitch (+/-25°) and Yaw (360°) adjustments make it easy to quickly and precisely register the projector. Three ceiling mounting methods: Flush mount, optional 1/4" threaded rod, or with an optional 1.5" NPT Threaded Extension Column. Compatible with a large assortment of accessories to easily overcome a variety of installation challenges. Allows lateral shift when using the optional LSB-100 Lateral Shift Accessory. The LSB-100 allows the projector to be shifted 3" right or left of the installation spot (5.75" on projectors under 15 lb). The LSB-100 is also used to accommodate different lens placement when projectors are replaced in existing installations. Maintains quick disconnect feature and includes All-Points Security System hardware. Heavy gauge solid steel design for secure mounting. UL-listed for proven strength, supports projector systems up to 50 lbs. Includes the All-Points Security System - exclusive locking hardware to protect against theft. Optional to use, the system locks the projector and mount with security hardware at all key connection points: Roll, Pitch and Yaw adjustments; bracket-to-projector; and mount-to-bracket. Compatible with Chief's PG-1A and PG-2A Projector Guard security cages. Low-profile design allows the RPAU to be flush mounted without additional accessories. Custom designed brackets allow quick projector disconnect without loss of registration, doesn't affect pre-set adjustments. Quick projector reconnect with convenient lamp and filter access. Integrated cable management allows cables to be routed through the top of the mount without additional accessories. Easy to maintain, it allows easy replacement of filter or bulb; offers proper ventilation; and lets you adjust the contour of the mount for the lowest profile possible. Threaded on both ends, the white Chief CMS-012018W is a 12 - 18" (30.4 - 45.7cm) adjustable extension column that can be used with any 1.5" NPT accessory to lower a projector or flat panel display to a desired height. Includes a continuously adjustable notch for length changes (1" increments) without disassembly, aluminum construction for fast and easy installation, and flow-through cable management with an integrated port for routing cables. Supports up to 500 pounds. The Chief CMS440 Speed-Connect Lightweight Suspended Ceiling Kit focuses on speed of installation. The Speed-Connect series was designed as an upgrade to the popular CMA series of ceiling mount accessories, integrating easy-to-use features that focus on saving time and maximizing security. 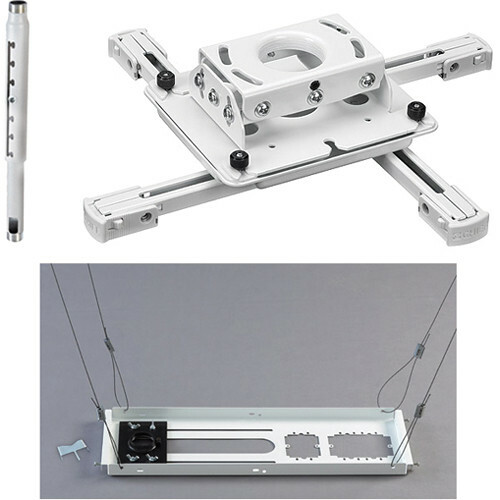 The Speed-Connect ceiling kit includes a host of design innovations, including the WireVice Cable Suspension System for quick and easy tie-off, and the TwisTile Tile Cutter, used for piercing holes into your ceiling tile. This design also features a continuously adjustable mounting slot for infinite placement options, along with single and dual electrical outlet cutouts, and All-Points tamper-resistant hardware at the column connection point. Pitch Adjustment: +/- 25° adjustment on each side of the mount. Loosen screw, adjust mount and tighten screw to hold adjustment. Full range of pitch in a flush mount installation. Yaw Adjustment: 360° by turning the mount on the threaded column and securing in place with set screw. 12° yaw possible on flush mount using slots in top of RPAUW. Box Dimensions (LxWxH) 10.5 x 10.3 x 4.55"
Box Dimensions (LxWxH) 17.8 x 2.8 x 2.5"
Box Dimensions (LxWxH) 27.25 x 9.25 x 1.75"